As promised, the Palestinian Authority has rejected transfer payments from Israel of taxes and customs collected by Israel on behalf of the PA. The transfer payment was pro-rated with a deduction reflecting an annual NIS 550 million that Israel is withholding for 2019 from the transfer payments, the same amount the PA pays terrorists and their families. 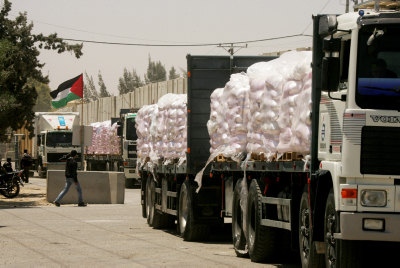 The deductions come from customs payments Israel collects on behalf of the PA, in accordance with the Paris Accords, which regulate economic relations between Israel and the PA. The PA announced last week that it would refuse to accept any money from Israel if it did not get the full amount it claims it is entitled to. As a result, the PA will not be paying salaries to clerks, civil servants or its police force this month – but the payments to terrorists and their families will continue, the PA said. At a meeting of top PA terrorists last week, PA chief Mahmoud Abbas said that the Israeli move would be “the final nail in the coffin of the Paris Accords,” a report by Yisrael Hayom said. “Israel is violating these agreements and the implications will be very serious. This is another siege of the Palestinians, who are already collapsing because of the evils of the occupation. All of these moves against us are part of the Trump plan. We will not allow this to happen,” Abbas said. A report in the Lebanese Al-Ahabar newspaper said that the rejection of the payment is designed to pressure Israel not to cut the payments, and to incite opposition to the impending Washington-based “deal of the century” peace plan that the administration of U.S. President Donald Trump will present after the Israeli elections. At a meeting last week with a delegation from the far-left J Street group, Abbas said that “even if we had just a small amount of money, NIS 20 or 30 million, our priority would be paying” the terrorists and their families. “We don’t need Israel’s money,” he said. There have been varying estimates of just how much the PA lays out for salaries for terrorists in Israeli prisons – paid directly to them or their families – and as pension payments for terrorists killed in the act of murdering Israelis. The Cabinet earlier this week said it would withhold about NIS 580 million in payments to the PA.